Before I get to the plumbing work we did today, here's some of the planting I've been doing lately. I put one little blue star creeper under the side stairs (the one in the center), and it got kind of stomped on (surprise!) so the other day I bought a flat of them and filled in a bit more on the theory that greater numbers will prevent catastrophic failure. This is a less than ideal location for the stuff: it prefers full sun and not quite so much stomping. 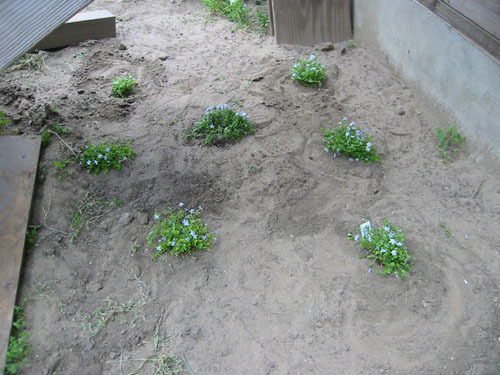 But it also tends to be invasive, so perhaps being in a shady, high-stomp part of the garden will keep it in check. At least it might take care of the dust problem under there. Speaking of stomping, today Noel finished installing the second anti-stomp fence around the dahlia bed (which also has lilies and some ornamental corn, and a few other things mixed in). 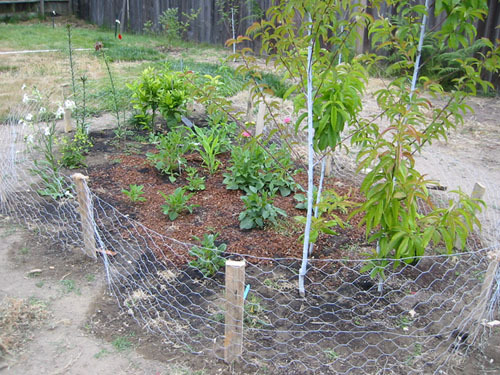 It's not the most elegant fence, but it does keep the dogs from tearing through the bed at top speed, which will probably help the plants out. 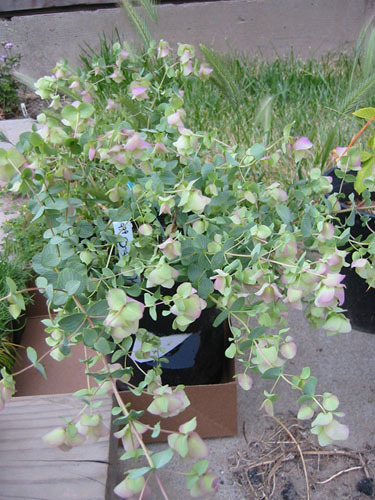 Yesterday while picking up some PVC fittings, I bought this ornamental oregano: Origanum rotundifolium 'Kent Beauty.' I am going to find a nice pot for it, because I think it will get kind of lost planted in the ground. I'm slowly starting to build up some nice perennials in pots. Mostly I haven't been bothering because a) pots can get pretty expensive and I have better things to spend that money on right now, and b) there's a lot of non-pot space to be filled up in the garden at the moment. 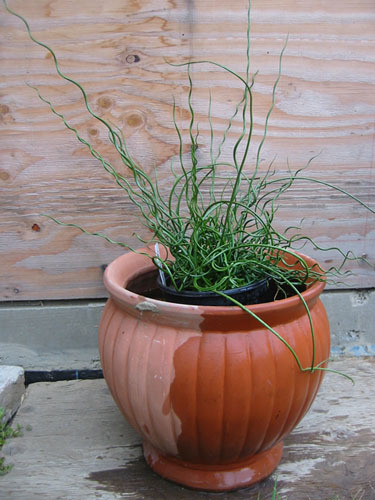 This is one exception, in part because I already had the pot: a curly rush, obtained at the Cabrillo College plant sale. This is one of my few pots with no drainage holes, so I stacked some chunks of concrete in it and filled it with water, then dropped in the rush and a mosquito dunk. It seems to be doing quite well, and I like how it looks against the plywood.